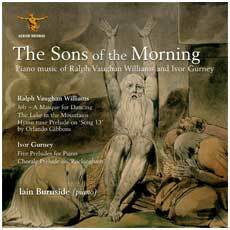 recording with this disc of rare repertoire of Vaughan Williams and Ivor Gurney. The Five Preludes for piano date from the second half of 1919, written during a period of remarkable and unexpected creativity from the 29 year-old composer and published war poet. Remarkable in that he composed over 40 songs between 1919 and 1922 alone as well as writing over 80 poems. Some of his finest, most lyrical works date from this period. Unexpected in that he had suffered a serious mental breakdown towards the end of the war and, in June 1918, had written a ‘good-bye letter’ to his friend Marion Scott. He was hearing imaginary voices which were urging him to commit suicide.